Human beings, always seeing patterns in things that aren't there. But part of being a fan of something is all about discussing theories and diving into interpretations of the franchises you're obsessed with. Here's 7 of the strangest, and sometimes silliest, Fan theories about the TV, Films and Games we love. Warning: Some of these theories, particularly the two at the bottom of this post, constitute as Spoilers for their respective franchises. If you've (somehow) not finished the Mass Effect trilogy or (understandably) haven't got round to reading all the A Song of Ice and Fire books, you might want to avoid reading further! This is either the longest string of coincidences, or the geniuses over at Pixar are playing and awfully convoluted long game. That doesn't stop Jon Negroni's timeline connecting every Pixar series into a cohesive universe from being any less of an amazing level of obsessiveness fans can have for the media they love. We covered Negroni's theory when it started making the rounds last year, but to sum it up - the Pixar movies are essentially, starting with Brave, the story of Humanity co-existing with (and battling against) the rise of advanced sentient animals, developing advanced technology to counteract them, before said technology gains sentience and rises up against us (culminating in Humans abandoning Earth in WALL-E). It's insane, but the way it connects each franchise is pretty neat, so you should check out one of the links above and give it a thorough read. When Skynet gains sentience in the Terminator franchise's lore, it nukes half the human race in oblivion, and then sends Terminators back in time eliminate the ancestors of the Human resistance's leader, John Connor. But if Skynet could nuke half the planet dead, why not go the whole hog and nuke all of them instead of engaging in some time-travel nonsense to finish the job? Maybe Skynet needs Humanity alive, to resist it, to give the deranged computer a purpose. The theory goes that Skynet is not only fulfilling some sort of quasi-predestination-paradox by sending Terminators back (and the same for Connor's own existence with Kyle going back and fathering him in the first film), but is manipulating time to keep Connor alive and to ensure some of Humanity survives... just so it has people to be a giant dickbag to in the future. Seems a bit pointless, but hey, even Skynet needs something to do when it's bored, I guess. Although they're sort of loosely meant to be continuations of one franchise the difference between Tim Burton's Batman and Batman Returns and Joel Schumacher's Batman Forever and Batman & Robin are... well, let's say stark to the say the least. The darker, grittier world portrayed by Burton becomes gaudy and ridiculous in Schumacher's movies, and the tone is radically different - as is even Batman himself. So how on earth would they all co-exist in one universe? By making Forever and Batman & Robin fictional in-universe too. This theory posits that Burton's Batman, broken by the belief that Catwoman is dead, hangs up his cowl - but then along comes a Director who decides to capitalise on the Batman story and make a series of campy, gaudy movies about the 'real' hero. George Clooney and Val Kilmer are merely actors hired to recreate the Keaton Batman, Billy Dee William's Harvey Dent gets whitewashed into Tommy Lee Jones - and there's a somewhat justification for all the dumb product tie in nonsense that way, as if it's just an extended series of adverts for Batman-related Merchandise... or Credit cards. I'm not sure I can give the time of day to a theory that attempts to validate that one. Now here's one that sounds pretty nifty for comic book fans at first, but then when you start to get... well, comic book fannish about it it falls apart a bit. As you can see from the above video (which doesn't include the multiple cameos he's made in this year's Comic book movies), Stan Lee likes to crop up in a superhero movie now and then. Oh okay, not now and then, practically all the time. But what if he wasn't playing Stan Lee, comic legend, but someone far more crucial to the Marvel Universe? This theory claims that Stan is playing the human form of the omnipotent superbeing Uatu the Watcher, a Cosmic Marvel character known for being able to see and observe future events thanks to his immortality and time travel shenanigans. Uatu was tasked with watching over Earth, sworn only to observe, never to interfere in its development. But, as our own Rob Bricken pointed out earlier this year, it kinda doesn't make sense for Stan Lee to be Uatu because all of his cameos revolve around him either not seeing things, or in some ways directly attempting to interfere with established events (like him trying to shift Mjolnir in Thor) - both of which go against Uatu's established character. Sometimes, Stan Lee is just... well, Stan Lee. You hear it every time someone thinks they want to be clever about The Lord of the Rings: 'Well, if the Eagles are so awesome, why don't they fly Frodo and the Ring to Mordor?'. Well, aside from the fact it does a great disservice to Tolkein's intent with the Eagles that underlies the ignorance behind the snarky remarks, what if that was the plan - and a little inconvenience like death got in the way of enacting it? This theory blew up earlier this year after a Redditor shared their fan theory (which they admitted came largely from knowledge of the movies rather than the books), and essentially assumes that Gandalf had always planned to hitch a feathery flight, and then his close encounter with the Balrog put a stop to that. Gandalf leads the fellowship towards the Misty Mountains, home of the Eagles, but they have to go through Moria. 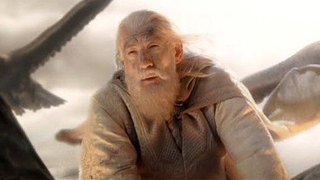 When he meets his supposed end there, he infamously cries 'Fly you fools! ', puportadly a subtle-as-a-brick hint to the rest of the gang to find the Eagles and get a ride. So why not resume the plan when he comes back as Gandalf the White? Well, apparently it's a little Wizard amnesia, and also at that point Gandalf has no idea where Sam and Frodo are (and there's also bigger problems, like Saruman's growing army attacking Rohan). So no insta-Eagle gratification for you! Yes, it's a bit silly, but still, at least it's a bit fresher than all those tired Eagle-taxi jokes. Image credit: Not fan art, but actual early concept art for Mass Effect 3 featuring an Indoctrinated Shepard, by Bioware artist Matt Rhodes. When the final game of the Mass Effect trilogy came out, you might remember there was a bit of a furore over the way the game ended. Well, I say there was a bit of a furore - people were livid. They felt cheated out of a proper ending to their character's stories. They started fan campaigns declaring the need to 'retake' the series from Bioware. They sent angry Cupcakes to Developers. They complained to the FTC. Meanwhile, those who couldn't accept the way the game came to a close, began searching for something, anything, they could interpret from the series that soothed their frustrations. And thus, the Indoctrination Theory was born. The theory was wildly popular at the height of the controversy over Mass Effect 3, but as Bioware moved to try and rectify people's anger, including an 'extended cut' DLC that aimed to address most concerns, people have sort of waned on the theory. There are still plenty of diehards who hold it to heart though. Ah, Game of Thrones. I don't think there's been a recent phenomenon (well, the show at least - the book theories have been going around for years!) that's inspired so many theories. Everything from the infamous R+L=J - I leave that for you to Google - to even the recently debunked conspiracy that George R R Martin had completed all the books and was holding on to them in some sort of bizarre attempt to make more money. Hell, there's so many of them we have a handy-dandy guide to the ones you absolutely need to know! 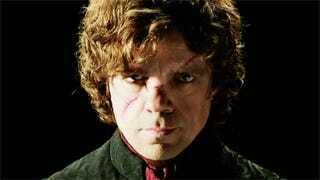 But one stands above them all as one of the wackiest theories: What if Tyrion Lannister was actually of Targaryen blood? Here's the evidence: the Mad King Aerys Targaryen was infatuated with Twyin Lannister's wife, Joanna - and that some point after Tywin's marriage, he slept with Joanna, getting her pregnant with Tyrion. In the books Tyrion is described with physical attributes that are closer to the Targaryens (lighter, white-blond hair and Heterochromia - one eye being a colour similar to that of Targaryens), and has a deep fascination with Dragons. And Tywin's last words declaring Tyrion 'No son of Mine', along with his regular disdain that he has to treat Tyrion as one of his own has seen many fans interpret them as subtle barbs that Twyin knew that Tyrion was secretly Aerys' child. So if some theories hold to be true, the three heads of the dragon prophecised to Daenerys at the House of the Undying are her, Jon Snow and Tyrion. In all honesty it does sound like a bit of fanservice - Tyrion is far and away one of the most popular characters in the series, so tying him into the overarching story like that seems almost like it's people trying to wish him into some sort of Anti-GRRM plot armour. But at the same time, there's already another Targaryen running around in the books now: Aegon, grown up having survived the sacking of Kings Landing and returned to Westeros to take what is his, complicating things a bit more. We'll see how the series pans out, whenever George gets round to it - but it's definitely a weird one. There's definitely a lot more out there - What are some of the craziest fan theories you've heard about? Got any radical Head-Canon moments of your own? Share them in the comments!